Prices start from just USD $1,049 per person! Have you always dreamed of hiking to the base camp of the world’s highest mountain – Mount Everest (8,848m/29,029ft)? 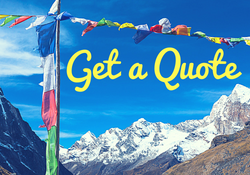 Well now you can, and we promise that your Mt Everest Base Camp trek with us will be all that you dreamed of! 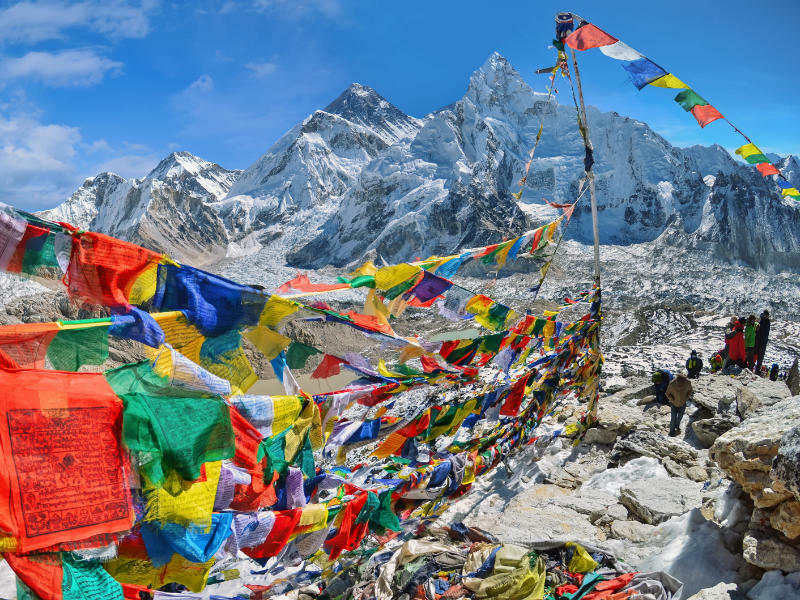 Trekking beyond the base camp to the summit of Kala Patthar with the most spectacular views of Everest is every bit as wonderful and amazing as you might imagine. From start to finish, this trek is packed full of adventure. The stunning natural beauty will take your breath away, time after time. You’ll discover new levels of personal endurance and accomplish feats you never thought possible. You’ll experience the fun and laid back culture of the Sherpa. 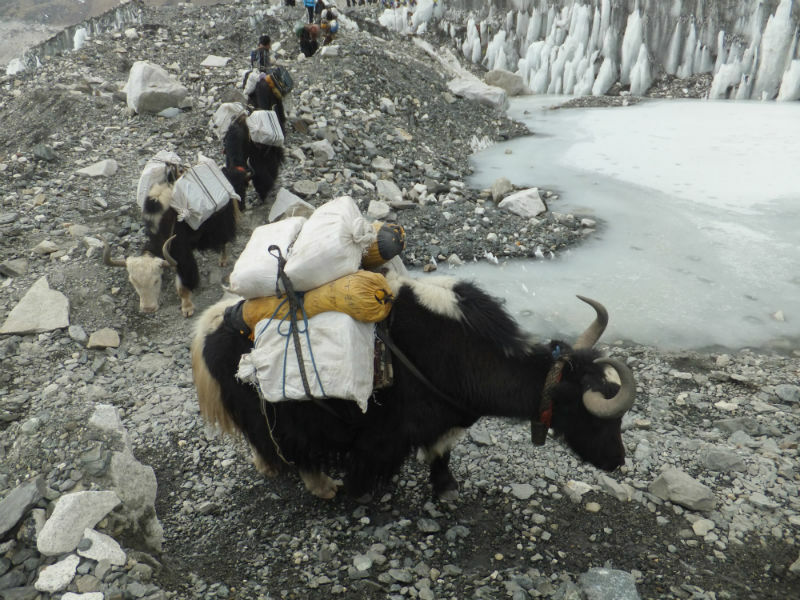 Come face to face with working yaks, and you’ll visit spiritual places that will deepen your self reflection. If you’re seeking pure wonder, this trek is for you! 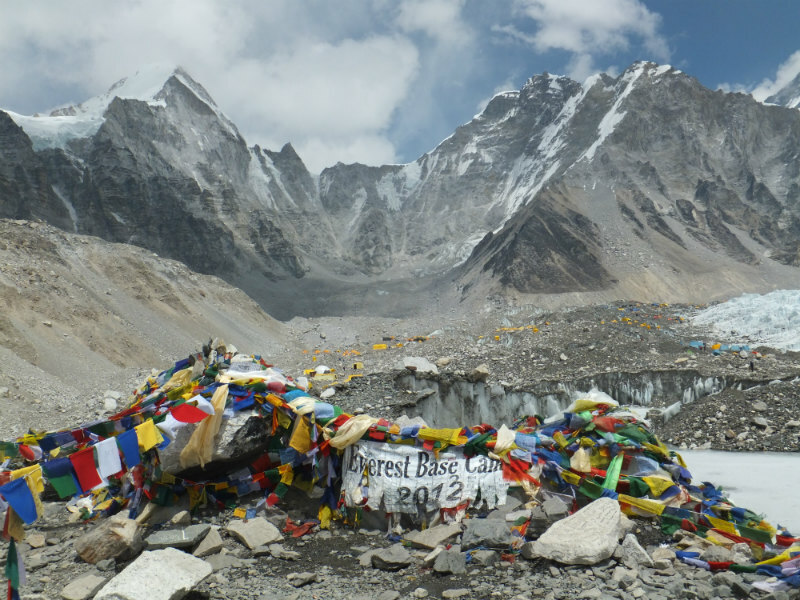 The Mt Everest Base Camp trek is a challenging trek, with a strenuous climb up to Kala Patthar. So a good level of fitness is required. Vibrant Namche Bazaar (3,440m/11,286ft) lives up to its name. Here you can find everything imaginable and more! Hike to one of the many vantage points of this amazing settlement and see clear views of Mount Everest for the first time! Visit singing monks in the Buddhist monastery at Tengboche. 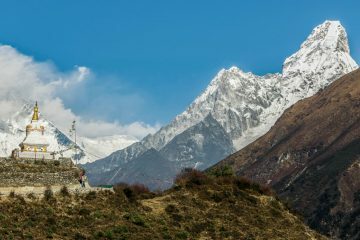 Take a spectacular photo of the Ama Dablam Stupa with its namesake in the background. Then, as we continue our ascent to Gorakshep, enjoy the beautiful scenery that just keeps getting better. 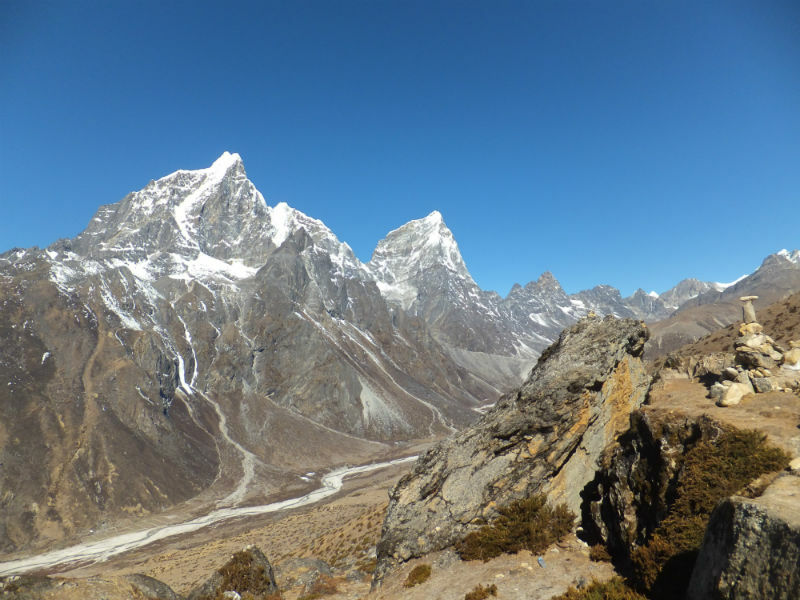 From Gorakshep we hike to Everest Base Camp. 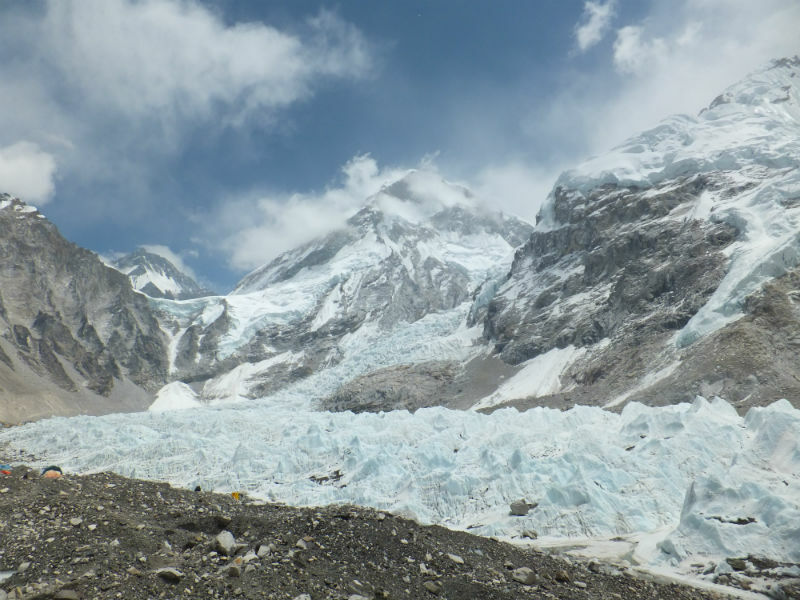 We can’t see Mount Everest from the camp, but you’ll have a great view of the Khumbu Icefall and Glacier. Depending on the time of year, you’ll see mountaineers and Sherpas preparing to summit the highest mountain in the world! We rise early the next morning and wrap up warm. 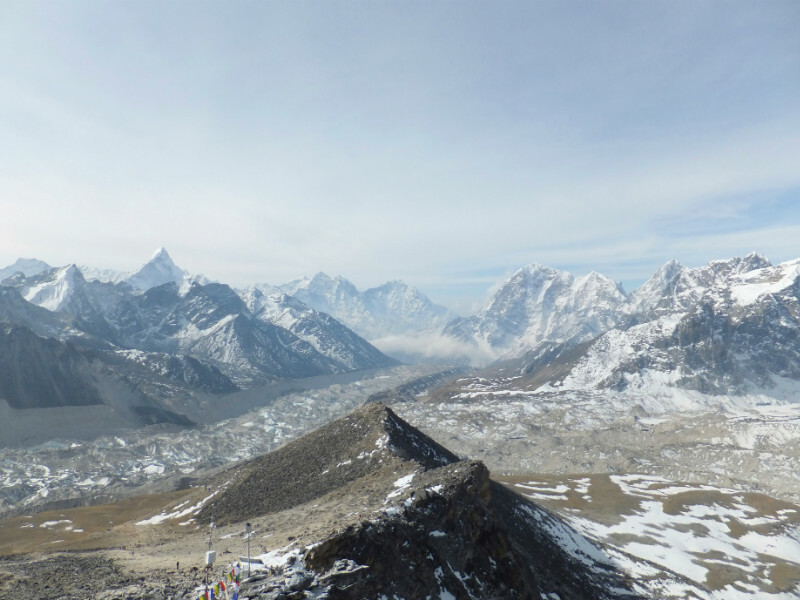 It’s time to make our own summit – Kala Patthar at a mind blowing 5,545m/18,192ft! We push ourselves to the limit as we hike up steeply for two hours, glancing to see the dramatic dawn view and wondering what it’s like by day. We’re about to find out! Watch the sunrise with a spectacular view of Mount Everest, Lhotse (8,516m/27,940ft) – the fourth highest mountain, Nuptse (7,861m/25,791ft), and Changtse (7,543m/24,747ft), among many others. 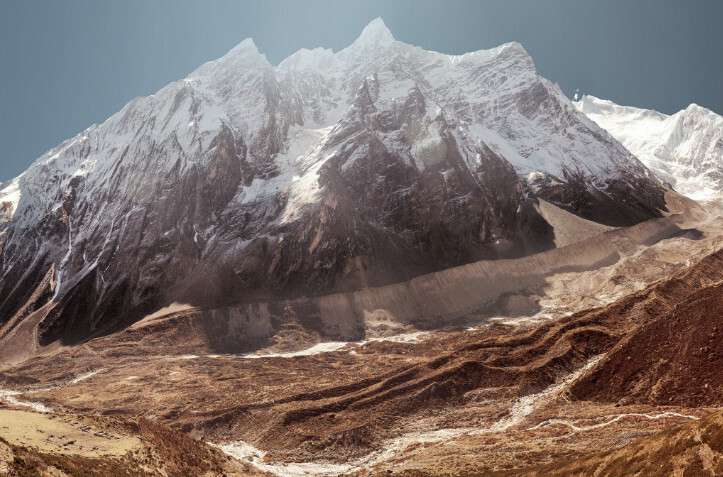 Of all the magnificent panoramic views in the Nepal Himalaya, this is the one! We return to Kathmandu the same way, taking a flight from Lukla and experiencing the adrenaline rush as the plane takes off downhill! After your Mt Everest Base Camp trek ‘adventure of a lifetime’, you’ll be glad to have time to relax and celebrate in the capital. After an early breakfast, we go straight to the airport for our flight to Lukla. The flight itself is an experience! We’ll board a small plane, so you’re guaranteed a good view. Watch the pilots make their preparations in the cockpit, then sit back, relax and enjoy an incredible 40 minute scenic flight into the mountains. 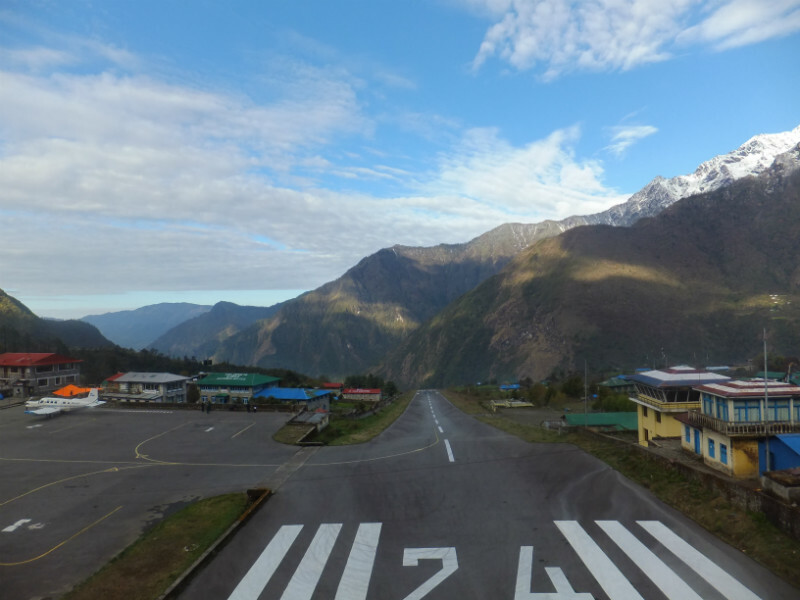 Once we touch down at Tenzing-Hillary airport, we’ll meet our other team members and get ready to begin our trek. We’ll walk just three hours today, as we begin adapting to the high altitude. After two hours walking, we lunch in Ghat. Then after another hour of walking, we arrive in Phakding where we’ll spend the night. The afternoon is yours to look around and relax! 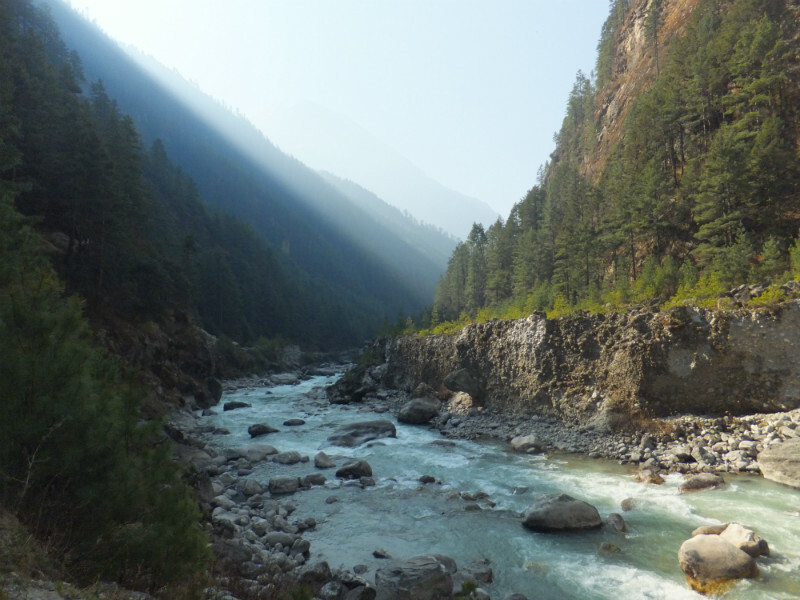 We start our day with some short uphills and downhills as we cross bridges above the Dudh Kosi river several times. Prepare yourself for an incredible view of Mount Thamserku (6,623m/21,729ft) as we pass through Benkar village. We continue to Monjo and the entrance to Sagarmatha (Mount Everest) National Park, where our trekking permits will be checked. Then after two and a half hours, we gradually descend to Jorsale and have lunch. If you haven’t tried it yet, dal bhat is a must! We continue for an hour along the riverbank to the impressive Hillary suspension bridge. Then you’ll really test your legs for the first time with a steep two hour climb up to Namche Bazaar, where you’ll be rewarded with incredible views of Everest, the fourth highest mountain Lhotse (8,516m/27,940ft), Kusum Kanguru, Taboche and many more. We’ll spend two nights in colourful Namche Bazaar whilst we acclimatise to the high altitude. We’re staying put, but it’s not a rest day! Hiking to a higher altitude and then descending to sleep is great for your acclimatisation. 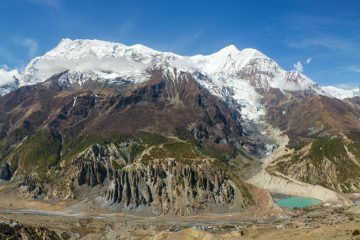 Plus there are many things to see and do around Namche! We start with a hike up to Syangboche home of the Hotel Everest View with a spectacular view of the highest mountain on Earth! Then we continue to the Sherpa village of Khumjung at the foot of sacred Mount Khumbila for lunch. Before we return to Namche, we visit the Sir Edmund Hillary school and hospital built by the Himalayan Trust. 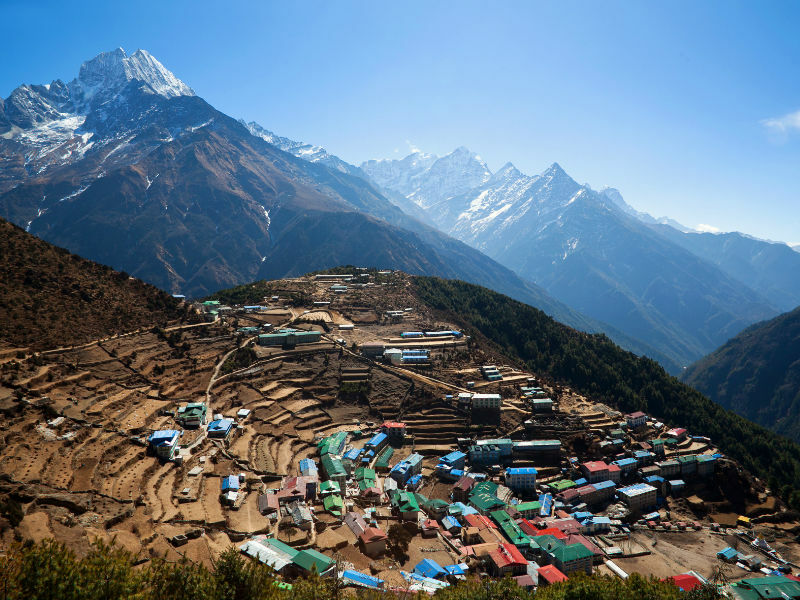 The rest of the day is yours to explore fascinating mountain city Namche Bazaar. Here you’ll find smiling Nepali shop owners, trekking gear, and trinkets galore! Day five promises the most magnificent views of the Himalaya yet! After 30 minutes you’ll see Everest, Lhotse, Nuptse, Ama Dablam, Taboche, Thamserku, and many other snow covered peaks. We continue easily for two and a half hours to our lunch stop at Phungki Thanka. Then we’ve got another long, steep climb up to Tengboche, home of Tibetan Buddhist monastery Dawa Choling Gompa, and a spectacular view of Everest. We spend the night here and take time to explore the monastery grounds before visiting the resident monks inside. We wake up in time to watch the sunrise over Everest, don’t forget your camera! 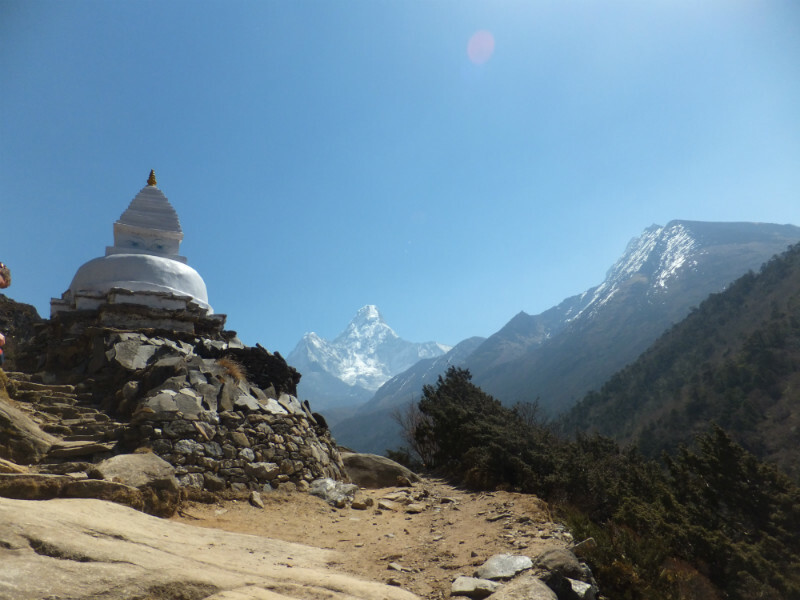 After breakfast, we’ve got an easy two hour walk to the vibrant village and Ama Dablam base camp – Pangboche. Another 30 minutes and we arrive at Somare for lunch. The stunning mountain scenery stays with us as we walk another two hours to Dingboche known for its many stone walls. We’ll spend two nights here, to acclimatise before we make our final ascent. We’ll have a fairly easy day, but you won’t want to miss a chance to hike up Nangkartshang Peak to see amazing views of Thamserku, Ama Dablam, Island Peak and many more mountains. The hike up will take us just under two hours, and an hour to return – in time for lunch in Dingboche. The afternoon is yours to relax. You’re right in the heart of the Himalaya now! The views in every direction will take your breath away. We’ll hike up gradually for two hours and stop for lunch in Thukla. Then we climb for an hour to pay our respects to deceased Everest summiteers on Lobuche Hill. We finish with an easy walk to Lobuche, our resting place for the night. 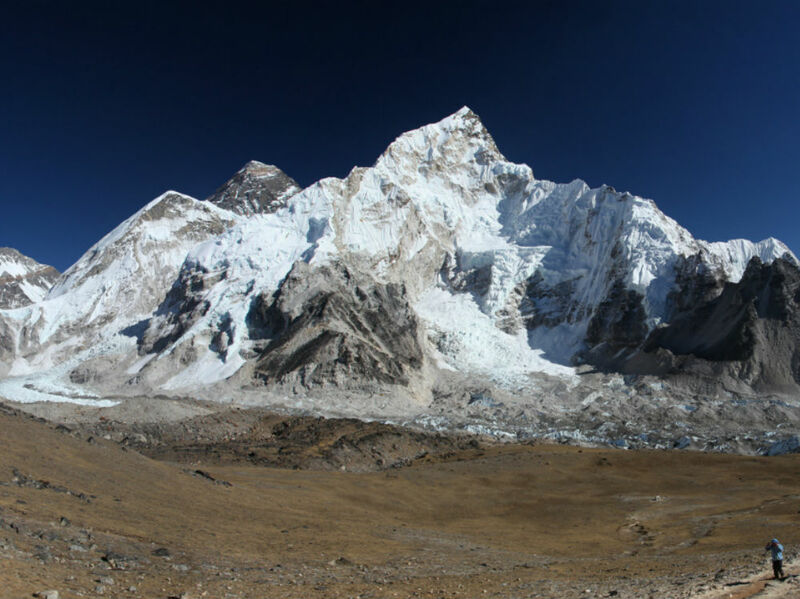 On day nine you’ll walk on the mighty Khumbu Glacier, enjoying spectacular, panoramic views down the valley. We’ll reach Gorakshep in just three hours. Watch out for yaks on the trail! After lunch we hike for two hours to our ultimate destination Everest Base Camp! Depending on the time of year, you’ll find an assortment of colourful tents and can see the hopeful summiteers making their preparations – it’s fascinating! We can’t actually see Everest from base camp, but that won’t stop you taking loads of photos of the huge Khumbu Icefall and Glacier. After all, how many people do you know that have been to Everest Base Camp?! It will take us an hour to get back to Gorakshep. Better get some rest – day ten is the big one! You’ll be pleased to have reached base camp, but there’s more to come! Wrap up warm and grab your head torch. 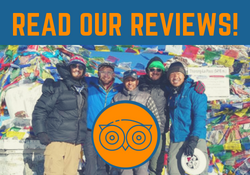 We make a very early start on day ten to climb to our highest point Kala Patthar, in time to see the most dramatic sunrise of your life! It’s the toughest climb of the trek and will take about two hours. We highly recommend you have something sweet in your pocket, you might need an energy boost! When you reach the top and watch as the sun lights up a dreamlike 360° landscape, you’ll be grinning from ear to ear. Soak up ‘the view of your life’! Everest, Nuptse, Lhotse, Pumori and Changtse stand tall among a forest of jagged white peaks, surrounding you in every direction – yes, it’s completely incredible! You might feel like you could stay right there on top of Kala Patthar forever, but what goes up must come down and we’re bound for our return journey. From Gorakshep we’ll walk for nearly five hours to Pheriche, before we take our rest. Down, down, down we go! Back the way we came, all the way to Namche. We’ve still got another full day of trekking, but you’ll likely be tempted to have a celebration drink in one of Namche’s many quirky bars! After another long, mostly easy walking day, we’ll be back where we started in Lukla and our trekking adventure comes to an end! Congratulations will certainly be in order! Prices for this trek start from just USD $1,049 per person! My friends and I trekked to Everest Base Camp with Nepalorama Trekking. It was one of the best experiences of my life! The flight to Lukla was like a scenic flight and you really do fly right into the mountain region. The trek was a real adventure. Scenery was amazing and it got more impressive the closer we got. My highlight was the view from Kala Patthar. You feel like you’re in another world, surrounded by huge mountains – I could have stayed there forever. Our guide was brilliant. We chatted with him all along the way, learning about Nepal and his culture. He spoke really good English. He was always smiling, and when it got tough was great at the encouragement to keep us going. He kept us well informed so we knew what to expect each day. We didn’t need to think about anything because he organised everything and he seemed to know most people along the way. I felt really lucky to have had him as our guide. We’d definitely use this company again. I was in awe of our porters too, always there before us with our bags waiting. If you’re thinking about trekking to EBC, definitely book it with Nepalorama Trekking! The trek and company are amazing! I completed Mount Everest Camp trekking in September 2017 with three other friends. It was a great and memorable trip. Krishna was the guide accompanied and guided us through the trek for 13 days. He took good care of us during the trek and made the trip a memorable one. He is very reliable guide to hire his service. Great Krishna thanks for the memorable Everest Base Camp trek. Look forward to another trek sometime in near future. Wonderful and happy 17 days EBC (Everest base camp )trekking trip. We are come from Taiwan, and we have 6 people, I like to do trekking with my friends. We can talk each other and help each other that’s feel so good. Everyday have comfortable bed and delicious foods, the best of thing that good weather everyday. Thanks GOD!! We go to EBC first and then Gokyo lake, amazing and beautiful ice mountains. Then we take the helicopter left Gokyo lake to Kathmandu and had a city sightseeing and shopping 1.5 days. It’s very cold in April, so don’t forget warm clothes, like gloves, sacks, hats, jacket, sunglasses… And don’t forget trekking point and crampons that maybe have snow and ice in Chola pass. Thanks for the professional guide Ramesh Adhikari and porters, see you next time! My friends! I went to EBC with my friends with some special task!! I’ve plan to ask my girlfriend to marry me!! Everyone in this trip help me so muchhh, especially Ramesh (our guide) and Khrisna (our ground coordination at KTM). Along the way, we had some classic trouble like many people. Some of us are sick by AMS. Our guide and porter are the truly heroes!! They all very friendly and helpfully that make you feel very safe when go trekking with this team. They take care us perfectly, such as if he know that you Look too tired, he’ll carry the stuff for you and help you as much as he can, or when you sick too. My friends needed to go down rapidly due to AMS. Our guide take care our friends so good and coordinate with his brother, who is waiting to coordinate everything on ground, call the helicopter to help my friends go to safety zone. Very thanks to them. So, if you would like to go trekking anywhere in Nepal, I’ll recommend Nepalorama for sure. Enjoy trekking!!! Very nice company. They take a good care to me and my friends I recommend this company for who want to trekking. We hiked the EBC trail in 2017 and they organized a personal tour for my girlfriend and I in a very short 9 day timeframe. I would recommend taking 12 days! As the trail was a challenge in this timeframe we were lucky to have the flexibility and support to take an extra acclimation day in Dingboche on the way up. As this changed the plan, our guide Ramesh was able to help us move our flight from Lukla back a day. On top of this they were able to endure a 13 hour hiking day from Gorak Shep to Namche to get us back in time! Many thanks to Ramesh and Padum for making this journey possible, we couldn’t have done it without them!